The LG V35 ThinQ looks exactly like the LG V30S ThinQ, a phone that looked exactly like the LG V30. Yes, it’s the same phone, but a little different – just as the LG V30S ThinQ was to the LG V30. It’s easy to see that LG has made a bit of a mess of its V-series phones. While this isn’t the sweeping overhaul you might have been hoping for, it treads forward by improving on a phone that has aged well with refreshed specs almost across the board. The cameras appear to be better, and it houses the Snapdragon 845 with 6GB of RAM, to name a few changes. What does this mean for the LG G7 ThinQ, which recently released across the world? LG has now made a mess of that, too, because if you want the best, latest specs in an LG phone, you’ll only find them in the V35 ThinQ right now. Given the big push for the G7 ThinQ, the timing for this phone’s release couldn’t be more strange. We’ll soon be putting this phone to the test for the final review, but as far as first impressions go, regardless of how you may feel about a thrice-recycled design, adding more power to last year’s excellent LG V30 can only be so bad – though the third time around, it can only be so good. As far as we know, the LG V35 will be a US-only affair, coming to AT&T as a carrier exclusive. Looking for a price? AT&T will be offering the phone for $30 per month for 30 months, which totals out to about $900. For those open to switching carriers, you’ll also be able to buy and use it on Google’s Project Fi carrier in the US. The phone is available for $900 outright there, too. While the AT&T and Fi-ready versions of the phone may seem identical, the Fi version hosts compatibility with a few more 3G and 4G bands, so be careful which one you invest in. If you’re hoping to have this phone in your hands soon, you’re in luck. Pre-sale starts on June 1 and the V35 ThinQ will officially launch on June 8. On the surface, this phone’s design hasn’t changed at all since the LG V30 released in September of 2017. You still have the all-glass design, fastened together with a aluminum frame that provides military-grade integrity capable of withstanding bends and drops, and IP68 protection against the elements. The dimensions are exactly the same to the V30, meaning any LG V30 case you bought or are considering will work on this one as well. Unlike the G7 ThinQ, LG hasn’t imposed a Google Assistant hardware key on its left side, nor is there a power button on the right. Things are right where the company left things with its original V30 design. Fortunately, that’s a good thing, but may take some getting used to. Say what you will about the rear-mounted fingerprint sensor that doubles as a power button, but the V35 ThinQ holds true to the V-series tradition of including a 3.5mm headphone jack, bolstered by a Quad DAC that greatly enhances the sound delivery when using wired headphones. The V35 ThinQ will be available in two colors: black and grey. LG hasn’t shared the official names for these colors, but we’ll update this article once we know for sure. On the inside is where you’ll find all of LG’s new handy work. The LG V35 ThinQ is a proper refresh internally, swapping out last year’s Snapdragon 835 for a new Snapdragon 845, and its 4GB of RAM for 6GB, putting it slightly above the Samsung Galaxy S9 and in direct competition with the OnePlus 6 and HTC U12 Plus. During our hands-on, the V35 ThinQ didn’t feel particularly faster than the V30, though we’re reserving judgment for the final review, where we’ll have the opportunity to test out the latest Android games and apps. With 6GB of RAM and a new chipset in tow, this phone will be ready for whatever you have to throw at it for a few years to come, and thanks to the return of its 2,880 x 1,440 QHD OLED display that’s fitted to an 18:9 aspect ratio, your visual entertainment, be it movies, games or virtual reality via Google Daydream, will look excellent while strapped into the Google Daydream View. We had a bit of time to play with the camera app, which like the LG G7 ThinQ, features Google Lens built-in, handy for real-time object recognition and copying text. This model features enhancements over the original V30’s camera hardware and software, boosting the wide-angle lens to 16MP over 13MP. The selfie cam is now a solid 8MP with f/1.9 aperture versus 5MP and f/2.2 aperture seen last year. We’re seeing big improvements here. Photos are no longer visibly blurry, which was a huge oversight that LG seems to have finally fixed. LG has also added 4K HDR video recording to the V35, now putting LG’s phone in a rather lonely (but growing) pack of phones that can record in HDR alongside the Sony Xperia XZ2 and the LG G7 ThinQ. Regarding battery performance, LG has opted for the same 3,300mAh battery capacity that we found in the V30, complete with wireless charging. There’s some concern that a more powerful chipset could put more drag on the battery performance, though the Snapdragon 845 is said to be quite a bit more efficient than the Snapdragon 835. Just how efficient is it? We’ll find out soon. LG seems pretty smitten with the V30, as this is technically the third phone to be released using the same design. It’s hard to blame LG though, as even after nearly a year of its initial release, it still feels fresh and more than able to take on this year’s flagship all-stars. 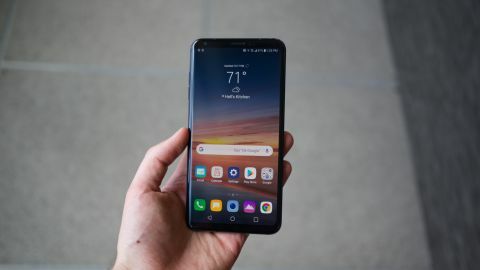 With the introduction of the LG V30S ThinQ, LG surprised us by updating the V30 with some of the newer phone’s biggest selling points. While it’s not possible for LG to do the same this time around, at least for the hardware improvements seen here, it’s hard to say if the company could add Google Project Fi support to the older model. Last year, I described the V30 as “a smartphone that doesn’t put the squeeze on useful features, filled to the brim with useful utilities”, and that sentiments rings true here, albeit with a little less clarity since it’s this phone’s third go around the track. A lot has changed in the world of smartphones in the past six to eight months. So, it should be interesting to put it up against the very latest devices for the full review.